Who was Susan anyhow? And exactly what was her relationship with Sweet William? Even though it's not a native, if you seed wild Sweet William (Dianthus barbatus) with common Black-Eyed Susan (Rudbeckia hirta), they'll bloom beautifully for you at exactly the same time. Because both are basically biennials, and her gold plus his bright reds and purples blooming together is a sight to gladden any gardener's heart. Since Susan is a North American native, this tale tells us English colonists must have given the golden beauty her name when they arrived in the New World. However, since most all the Black-Eyed Susan species are native to the Great Plains, plant experts have wondered for years how our colonists on the east coast could have given this wildflower the name it's had for centuries. But some recent research in Maryland (where "Susan" serves as the State Flower) shows that the plant was growing there during the colonial period. So like today, Black-Eyed Susans were probably across the continent from the beginning. Today, they are common in all 50 states and across Canada. The genus name for all Black-Eyed Susans is Rudbeckia. It's for the Rudbecks, a very famous Swedish father and son both named Olof. 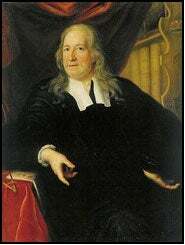 Olof the Elder (shown in the photo) lived from 1630-1702 and was a world- famous scientist known mostly for his accomplishments in medicine (anatomy) and liguistics, but was also known for studies in music and botany. Throughout his career, he had the strong support of Sweden's famous Queen Christina, and was a celebrity at her court. He established the first botanical garden in Sweden, which was originally called Rudbeck's Garden. Swedish scientist, Carolus Linneaus, the man who devised our system of plant nomenclature. So it's no surprise that Linneaus gave the name "Rudbeckia" to this important group of plants. By the way, a hundred years after the establishment of "Rudbeck's Garden," it was renamed for Linneaus. And a modern descendant of the Rudbecks is Alfred Nobel, originator of the Nobel Prizes. So it's safe to say that our lowly, common roadside "weed" has a very prestigious name. Ever since the beginning, the Black-Eyed Susan has figured prominently in things American. Every budding nature photographer has a prized photo, usually with a beautiful butterfly on a Black-Eyed Susan. After all, they're beautiful, and they're everywhere. But even the most sophisticated have chosen the "Susan" as a decorative motif. 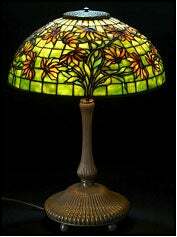 No less than Louis Comfort Tiffany himself immortalized this common wildflower along with much more aristocratic lilies, peonies, irises, and roses with a magnificent "Tiffany Lamp," now among the most prized American antiques. And the most visible annual celebration of our own Black-Eyed Susan is in the Sport of Kings, horse-racing. Each year, we all see the "Run for the Roses" which is the Kentucky Derby. But that's not the only famous run. The "Run for the Black-Eyed Susans" is at Baltimore's Preakness Stakes, as Maryland honors its state flower, and a horseshoe arrangement of "Susans" is placed around the winning horse's neck. At the Preakness, Black-Eyed Susans are everywhere! R. fulgida var sullivantii Perennial Similar to above, to 3 ft, parent to most perennials. "Goldsturm"
R. fulgida var speciosa Perennial A shorter variety to 18" tall with 1 ½-3" flowers. 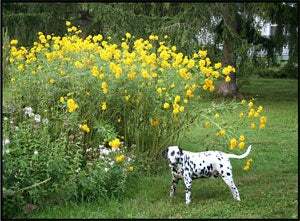 "Viette's Little Suzy"
R. lacinata Perennial Tall with lemon-yellow drooping flowers. To 9 ft. "Golden Glow"
R. nitida Perennial Drooping gold flowers on plants 3-4 ft. tall. "Goldquelle"
R. subtomentosa Perennial Black-Eyed Susan with blunt petals. 4 ½ ft. "Henry Eilers"
This is the gorgeous gold wildflower you see everywhere—growing on its own, often in great golden sheets of color along the highway, in unused fields, often in "disturbed ground" and maybe in your own backyard. 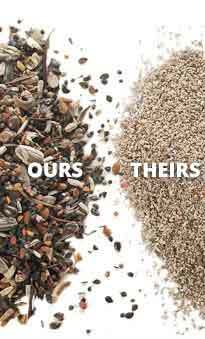 Generations of American children have picked them in proud bouquets, and they figure importantly in our culture. With apologies to our Canadian neighbors, I've always thought it is the quintessential American wildflower, since it is so widespread and so common, yet so beautiful, it symbolizes the American ideal of opportunity for all, enjoyed and available to everyone from our earliest natives and settlers to every American child alive today. It's definitely my favorite. Best of all, for gardeners, it's a snap to grow from seed, and is a staple of any good wildflower seed mixture. 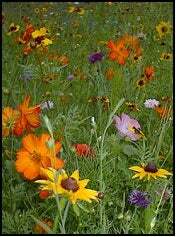 Because these beautiful flowers can easily be one of the major color-makers in any North American wildflower garden. However, the exact way it performs depends on where you live. It usually grows as a biennial, which means it takes two years to bloom from seed. Biennials live only two years, and bloom only their second season, then die after reseeding heavily. However, in some regions, R. hirta grows as an annual, blooming the first year. In other areas, experts insist it's perennial. In all my years of wildflower gardening, I've never seen it perform as a perennial. But most of my gardening has been in very warm (Florida) or very cold (Vermont) eastern U.S. climates. Two things for sure: In Vermont, Rudbeckia hirta is a classic biennial. From fall or spring seeding, it germinates quickly, forming a basal rosette of its signature "hairy" green leaves, and that's all it does. The elegant bloom stalks arise the second summer. In Florida, with no frost, the same seeding will bring bloom late in the summer, which leads many southern gardeners to consider the plant an annual. All this means is that it will bloom the first year as long as the growing season is long enough. For example, garden expert Allan Armitage, who lives in Georgia, calls the common wildflower an annual, and reports that Rudbeckia hirta, seeded naturally in the fall, begins blooming for him and his wife (Susan) the first week of June, and continues for two months. The short life of the non-perennial form tempted many hybridizers to try to create a more-perennial plant from this popular wildflower. The most successful, and a sensation when it appeared, was The Gloriosa Daisy, introduced by the W. Atlee Burpee Seed Company in the 1950's. This strain, still widely grown from seed, creates a plant a bit larger than the common wildflower, with blooms that are totally different. First of all, the flowers are about three times the size of the wildflower's blooms—often 6" across. And "Gloriosas" are always a mixture of pure yellow and splashy bicolors, most with dark mahogany red splotches at the base of the petals, creating a stunning pinwheel effect. Others in the mix are fully double. But all the flowers are large, making the Gloriosa strain a big favorite. However, while the blooms are spectacular, the perennial qualities are weak. Most stands of Gloriosa Daisy will "run out" in about 2-3 years in a very cold climate, earning them the dreaded name, "short-lived perennial." 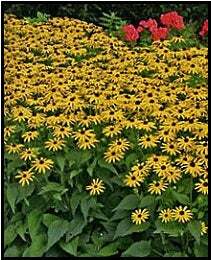 For dependably perennial plants, the hybridizers had to turn to other Rudbeckia species. Rudbeckia fulgida, the great look-alike perennial wildflower, and R. "Goldsturm"
The great confusion among the Rudbeckias arises from the fact that the native biennial (R. hirta) and an important hardy perennial species (R. fulgida) look almost exactly alike. So many laymen don't realize that the beautiful roadside "weeds" they see are botanically different from the long-blooming perennial clumps seen in almost all American perennial gardens—from home gardens to those "decorative plantings" at shopping malls and gas stations. They're everywhere, since the perennial Black-Eyed Susans are some of the most useful landscape plants of them all, when it comes to dependable every-year long-blooming mid-summer color. This variety is the parent of the king of all the commercial perennials, a plant commonly called Rudbeckia 'Goldsturm'. That's German for "gold storm," and a gold storm it is. This fantastically successful perennial introduction, developed in Germany, is one of the most popular and widely-planted flowering plants in America, and justly so. The flowers are clear, golden yellow, and a bit larger than the wildflower, but very much the same. Each plant, once it matures, puts up a whole bouquet (probably 20) of these big flowers and holds them in bloom for weeks, even in the heat of mid-summer. This is the kind of plant every perennial gardener loves. Today, "Goldsturm" is super-popular worldwide. Rudbeckia fulgida var speciosa This variety of the species (sometimes referred to as var newmanii) is much the same as the one above, and is the parent of several other well-known garden perennials including "Viette's Little Suzy." It has similar standard Black-Eyed Susan blooms, but is shorter, growing to only about 18". This one is named after a famous family of hybridizers in the US, descended from Martin Viette, a Swiss gardener who arrived on Long Island in 1920. He and his family have created a long list of excellent new perennials, and this is one of them. C. Rudbeckia lacinata, the very tall parent of "Golden Glow"
It grows so tall in the wild (up to 9ft.) it's often assumed to be a sunflower, but it is not. The flowers are very large with drooping petals, colored a pale lemon yellow. The species can be quite impressive in a wildflower meadow, since the big flowers and petals often flutter' in the breeze, standing above other plants. But it's too big for most gardens. This species is best known as the wild parent of one of your great-grandmother's favorite flowers, Golden Glow. It is a tall plant, up to 5 ft, which was introduced in 1894. The yellow blooms are fully double, and resemble a bright yellow chrysanthemum. Not very popular and not so well known today, they, like the parents, are often assumed to be short sunflowers or tall mums. Golden Glow forms clusters of flowers on the tall stems which are famous for "toppling over" as the flowers open. Millions of gardeners have rigged stakes to keep old Golden Glow plants standing tall with their beautiful blooms. They are some of the toughest, longest-lasting perennials in old gardens. A shorter version is called "Golden Drop," and grows to only 2-3 feet. E. Rudbeckia nitida, another tall one with large, golden flowers. This species is tall like R. lacinata and has a distinctive greenish color in its center. From this wild beauty, the hybridizers have created a sensational plant called R. nitida "Herbstsonne", a tall (60-72") perennial with colossal golden flowers. The petals are wide and beautiful, and droop somewhat, but the plant makes a spectacular, elegant show. Another hybrid called "Goldquelle" is shorter with double flowers. F. Rudbeckia subtomentosa, another wild one with somewhat different flowers. This Black-eyed susan is native to the central US from Wisconsin to Texas. It grows to only about 4 ½ ft, and its flowers are distinguished by blunt tips on each petal. A commercial cultivar from this species is "Henry Eilers", which grows to 4 feet and has large, tubular petals with blunt tips. Trading on the fame of the real thing, someone named a small tropical vine that grows easily indoors the "Black-Eyed Susan Vine." Surely that was smart marketing, but that little vine with its little yellow trumpet blooms is Thunbergia alata, nowhere near the Rudbeckia genus. Though the vine has nothing in common but flower color, there are other North American wildflowers who are close relatives. In fact, several of them were once considered Rudbeckias, but are now more correctly classified in their own genus. The now very famous medicinal, Echinacea and all its hybrids are called "Coneflowers," with Echinacea purpurea, the Purple Coneflower, as the best known. The Prairie Coneflower (yellow) and Mexican Hat (red), both named Ratibida columnaris, are closely related, as is the Grey-Headed Coneflower, Ratibida pinnata. These are all close relatives, but not Rudbeckias.